Cotton Candy is an album by Al Hirt that was released in 1964 by RCA Victor. The album features the Anita Kerr Singers. The title track hit No. 3 on the Easy Listening chart and No. 15 on the Billboard Hot 100. "Walkin'" was released as the B-Side to "Cotton Candy" and reached No. 103 on the Billboard 100. The album landed on the Billboard 200 chart in 1964, reaching #6. ↑ Al Hirt, Cotton Candy. Retrieved April 7, 2013. 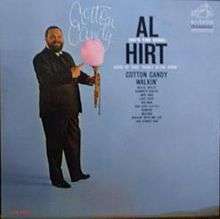 ↑ Al Hirt, Cotton Candy charting singles. Retrieved April 7, 2013. ↑ Al Hirt, "Walkin'" Chart Position. Retrieved April 7, 2013.